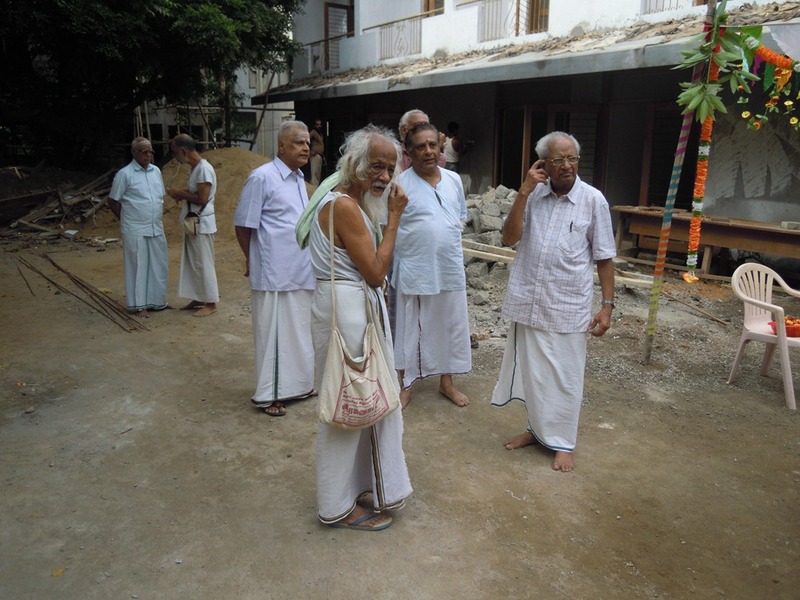 Ramana Ashram has been working on rebuilding guest housing in the Morvi Guest House Compound since early 2011, and during this time, with fewer rooms available, only accepted short stays (3 days) for guests. This is about to change, as the construction is completed. 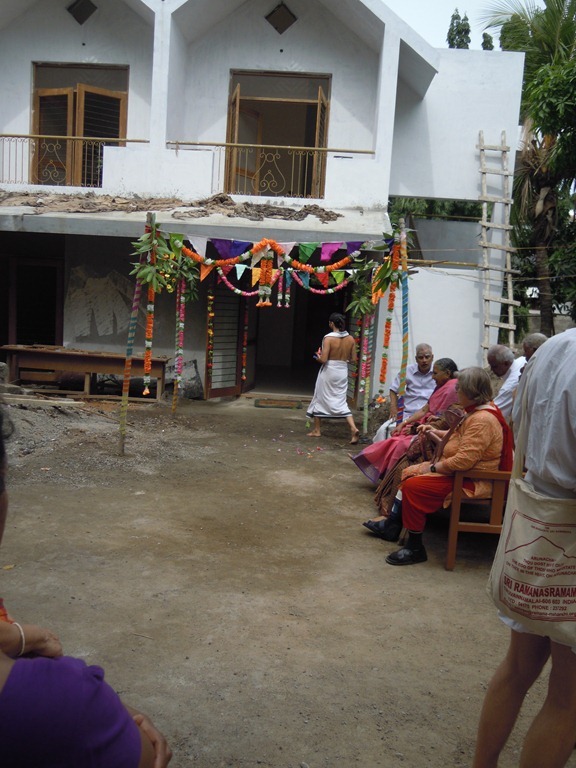 Ramana Ashram now says that the first of the new guest rooms will open by 1 November, 2012. 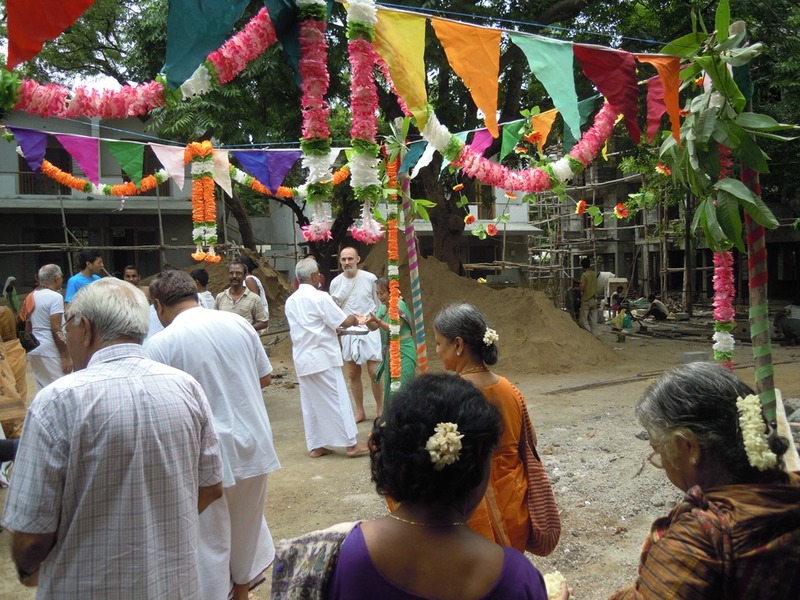 This project has been documented in several posts on this blog: Good News about Room Availability at Ramana Ashram, Update on Rooms at Ramanasramam, and Construction at Ramanasramam. 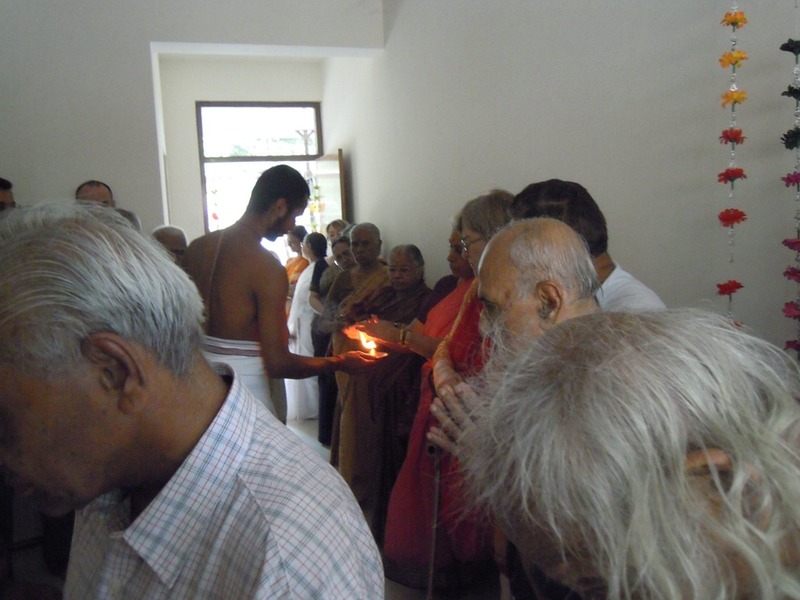 On Friday, 7 September, a special pooja was held to celebrate the coming completion of this project. 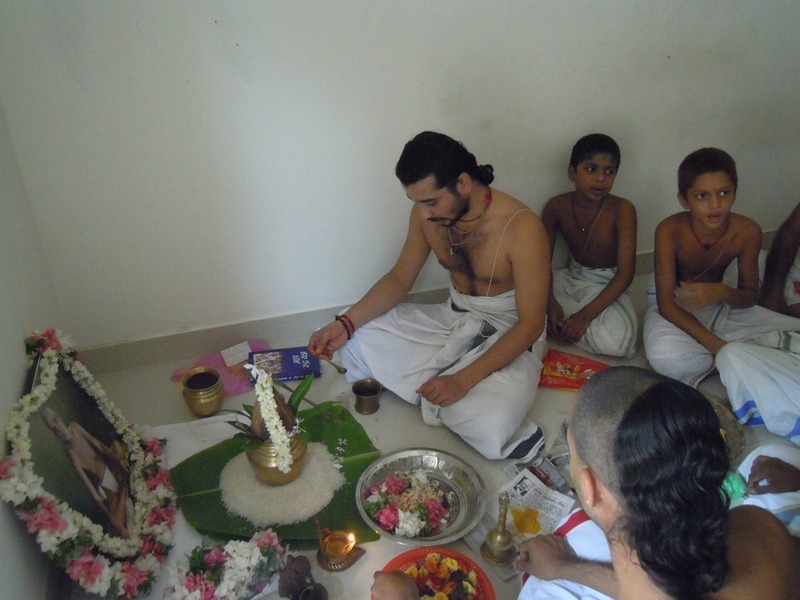 The pooja is shown in this post. In the Guest Housing complex, two-story buildings have been constructed. On the bottom floor will be single-person rooms, on the top, double rooms. 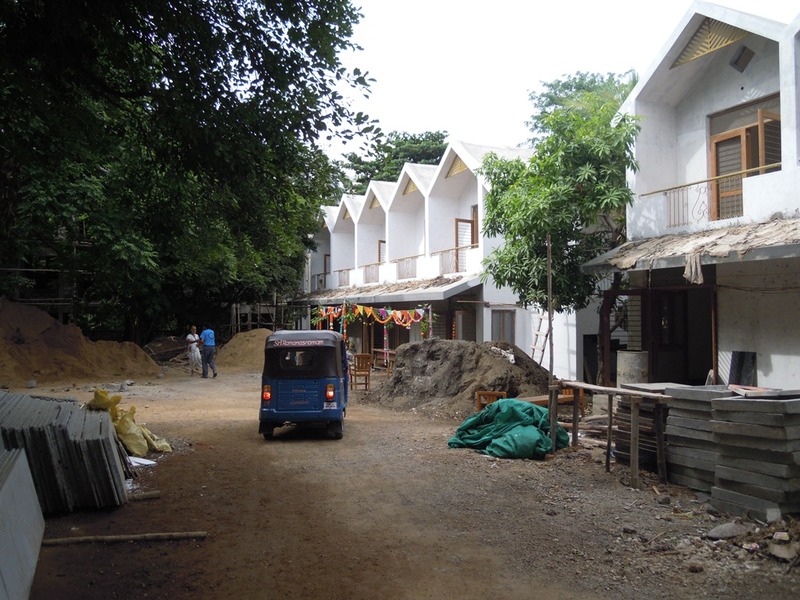 In the rear of the compound (and not pictured here) will be family ‘cottages’ with front rooms and a bedroom. Before the construction there were 45 old guest rooms in this compound. Some of the rooms leaked water badly, and I think were not used because of this. 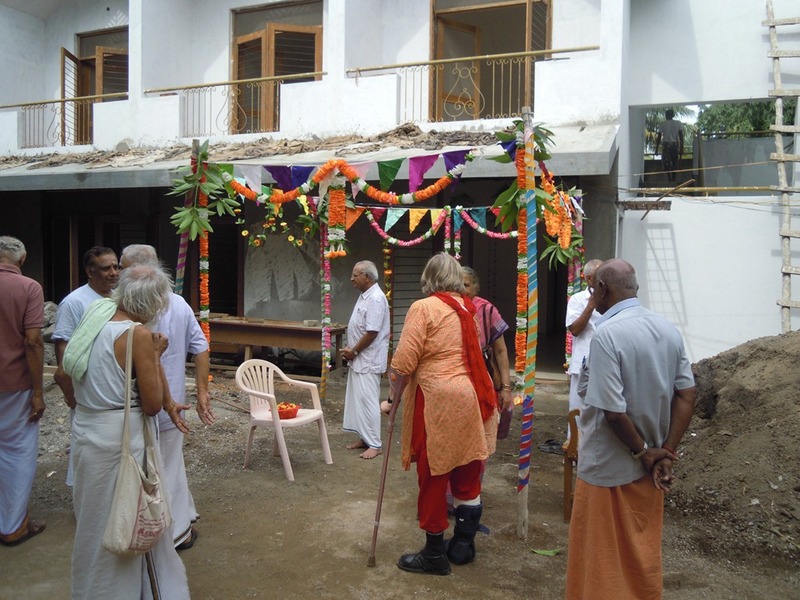 So this project adds additional guest room capacity to the ashram. This is very good, since there are already so many visitors every year, and with more and more people coming. The photo below shows a group of the new rooms, from the view of the inside garden area. The actual entrances are on the other side, not pictured. This inner area will become a garden, and each room will look out onto a wonderful green-planted space. Workers are still very busy, since much has to be done to complete the project. 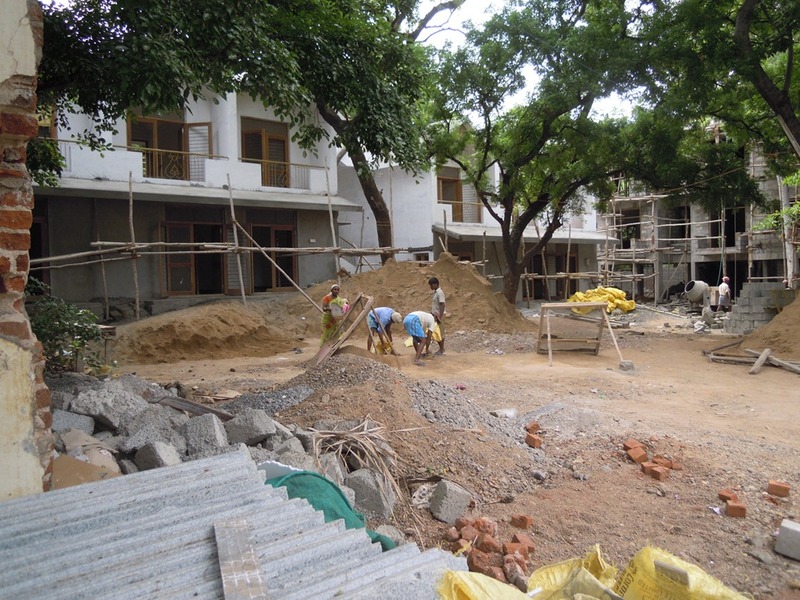 When the rooms open, work will still be going on for the garden area. Right now, it is a construction area. 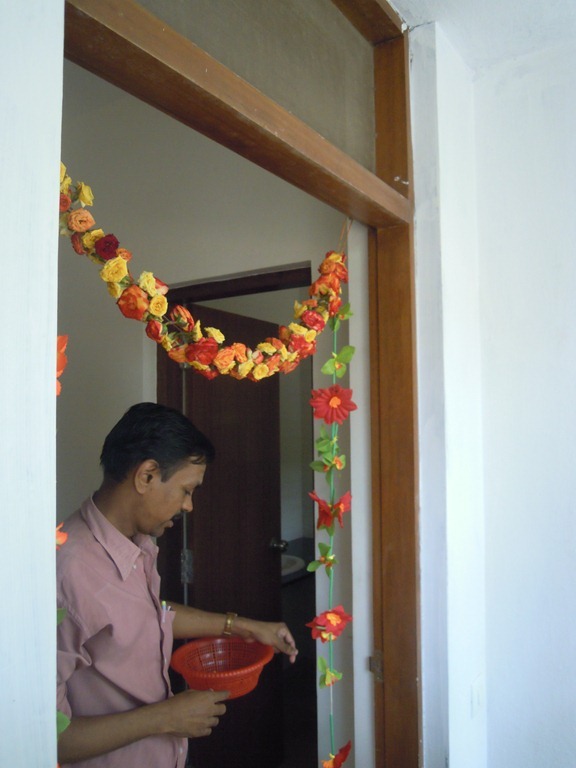 The outside of one room is decorated for today’s pooja, and already Smt. Susila Ramanana, wife of Sri V.S.Ramanan, is sitting down to wait. At this time, Dr. Anand (in the blue shirt) has arrived for the event. 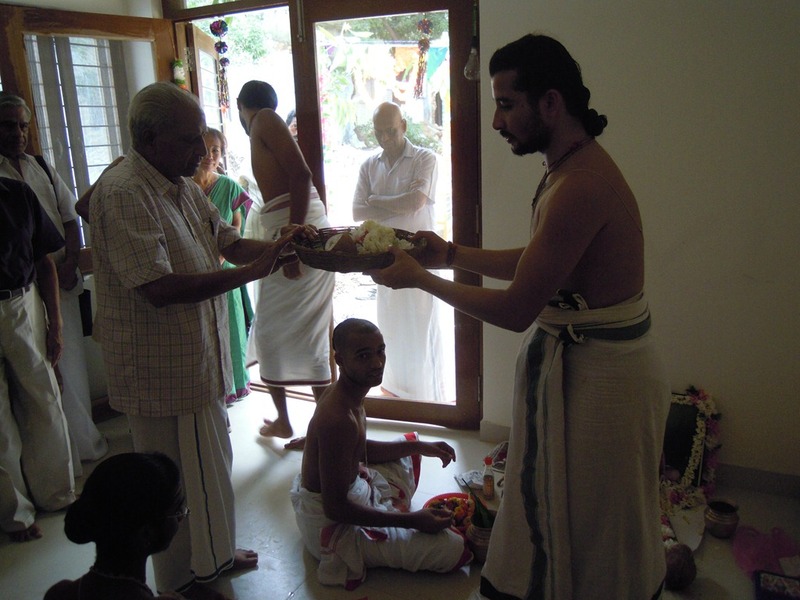 He is the eldest son of Sri V.S.Ramanan, the Ramanasramam president and Bhagavan’s grand-nephew. 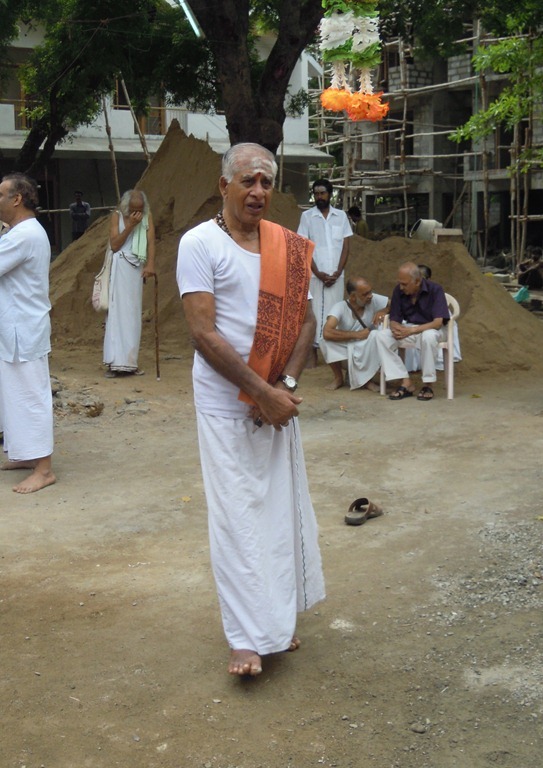 As his father ages, Dr. Anand is taking a larger role for Ramanasramam. He presently resides in the USA. 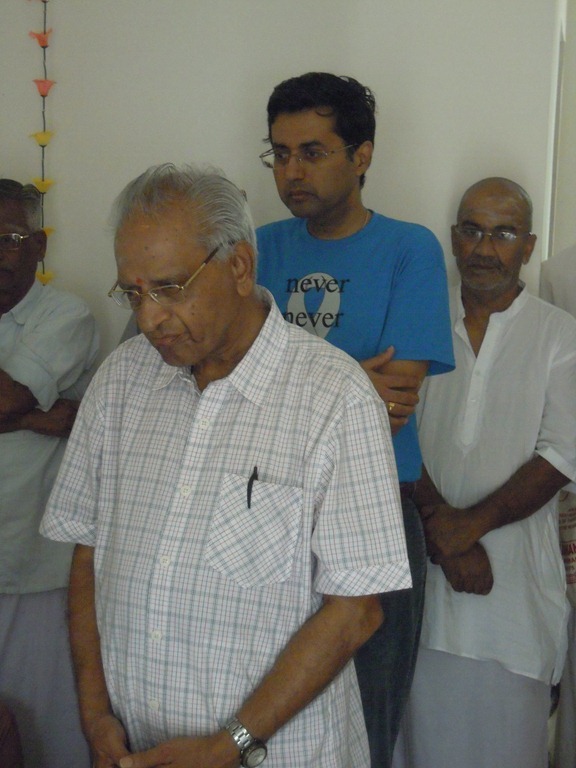 Behind him is J. Jayaraman, the Head Librarian. 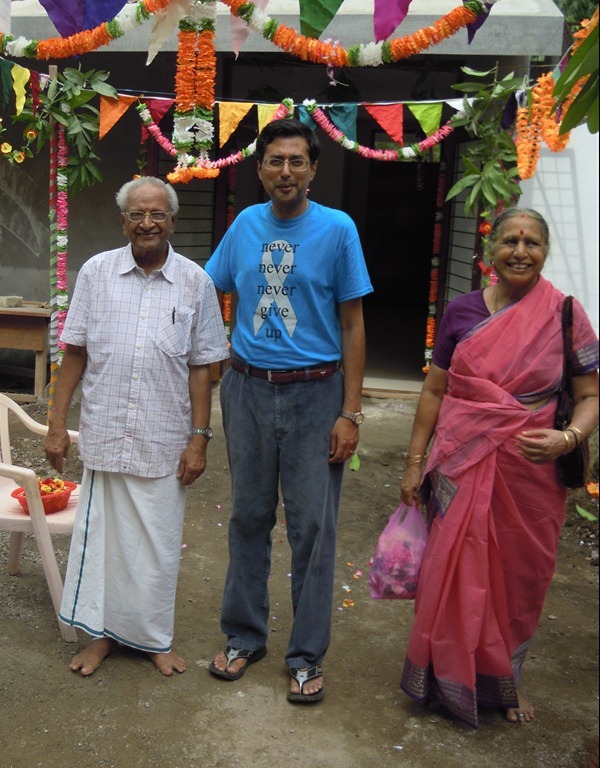 A family photo, with Dr. Anand, his father, Sri V.S.Ramanan, (Sundaram) and Smt. Susila Ramanan, his mother. Below, K.V.S. 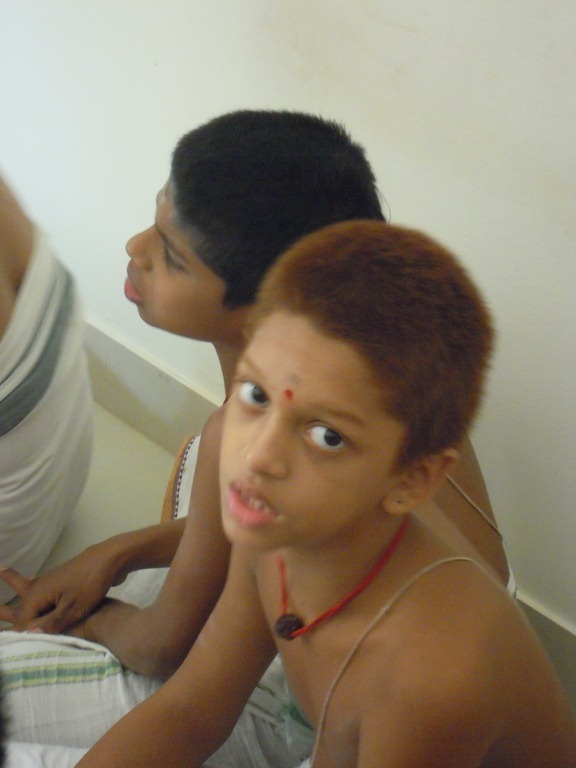 and other men from the Ashram. Perhaps you recognize some of them. 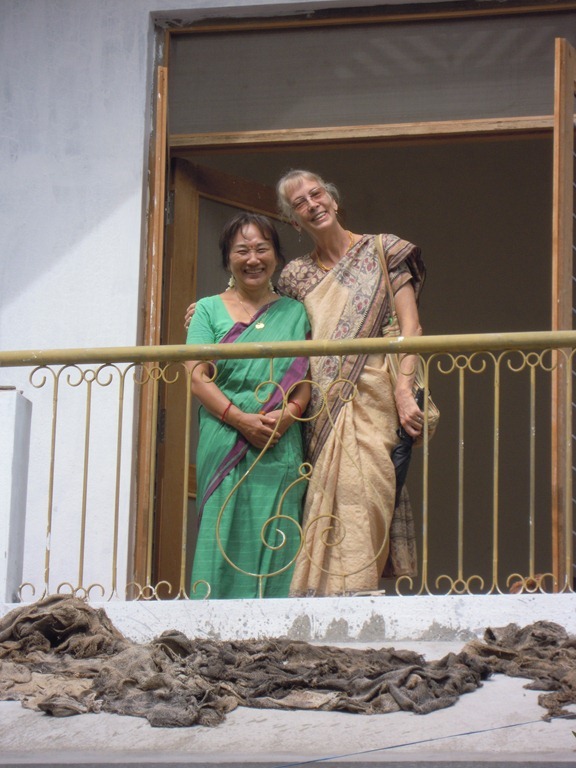 An upstairs room is inspected by two non-Indian women who work at Ramana Ashram, Sunya and Patricia. 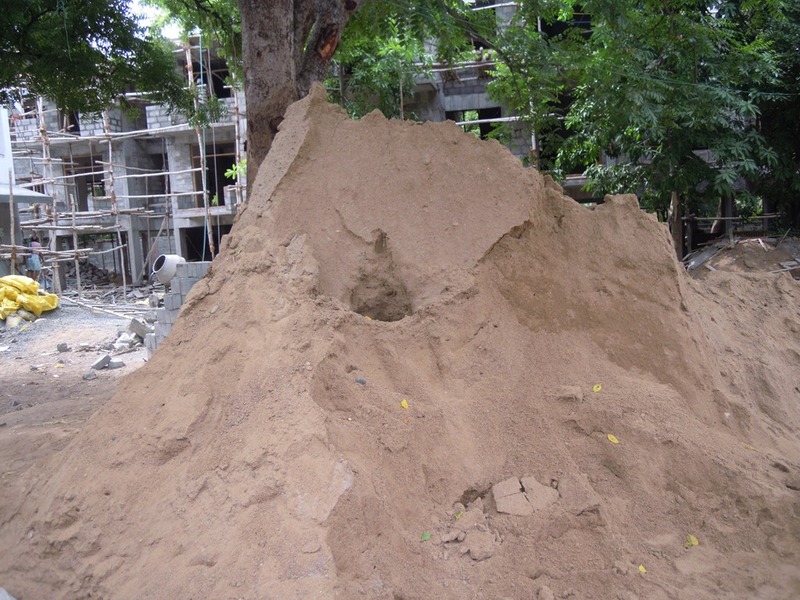 A pile of sand in the construction area reminds some of us of Arunachala. You can even see the tunnel that goes underground to the heart of Arunachala. A priest enters. It is almost time for today’s function to begin. 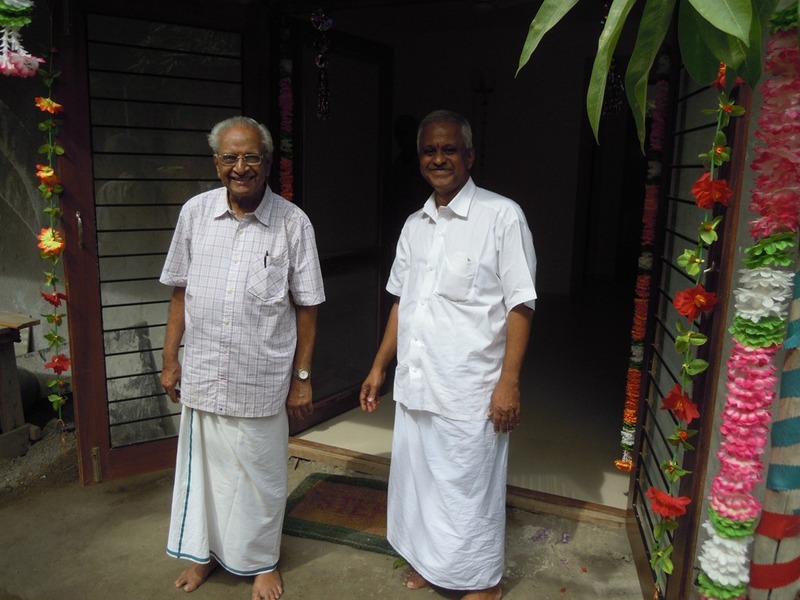 Ashram President Sri V.S.Ramanan and Krishna, one of his main assistants, stand in front of the new room. N. S. Ramanan, cousin of V.S.Ramanan. 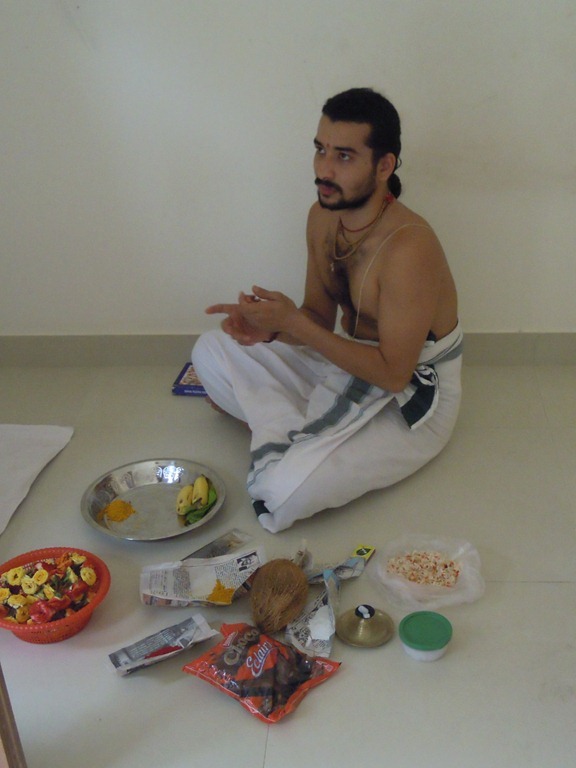 The priest is setting up for the pooja. 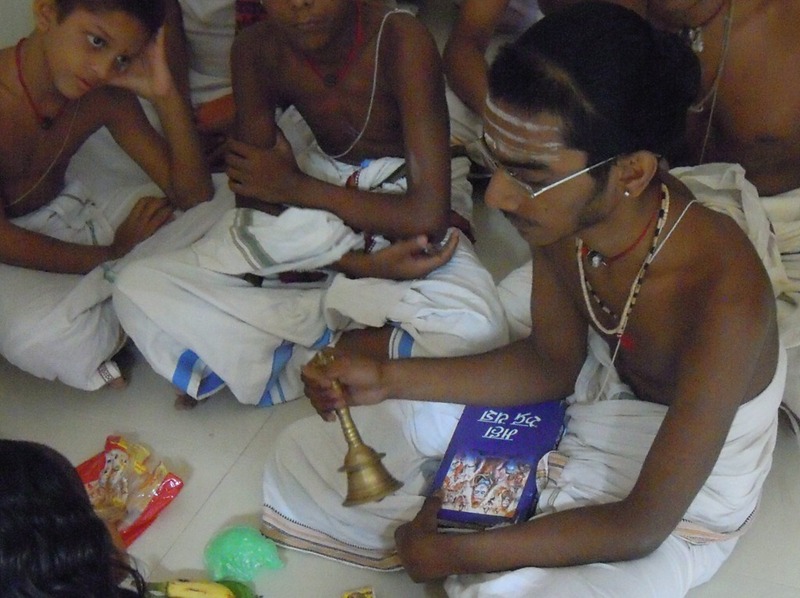 He is a young man, I think from the Vedapatasala (school for Brahmin priests) at Ramanasramam. 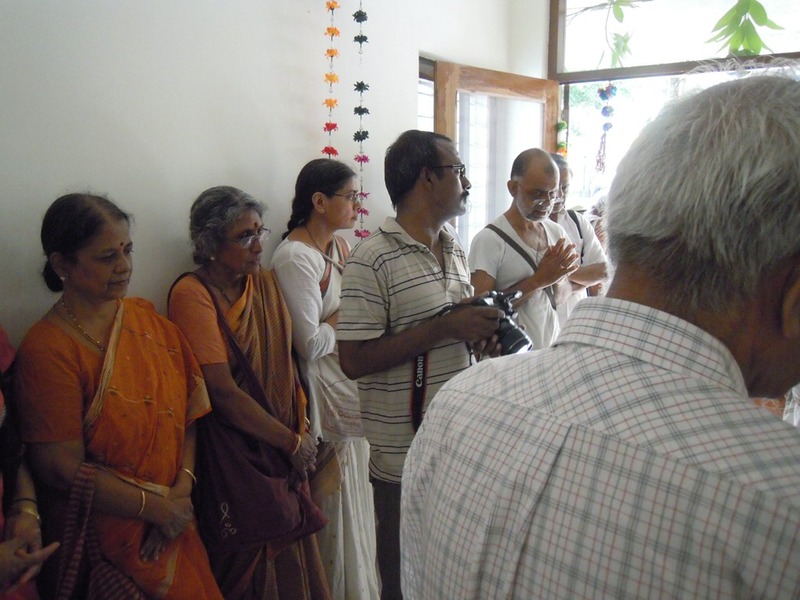 Outside the room, a good crowd has gathered waiting for the pooja to commence. 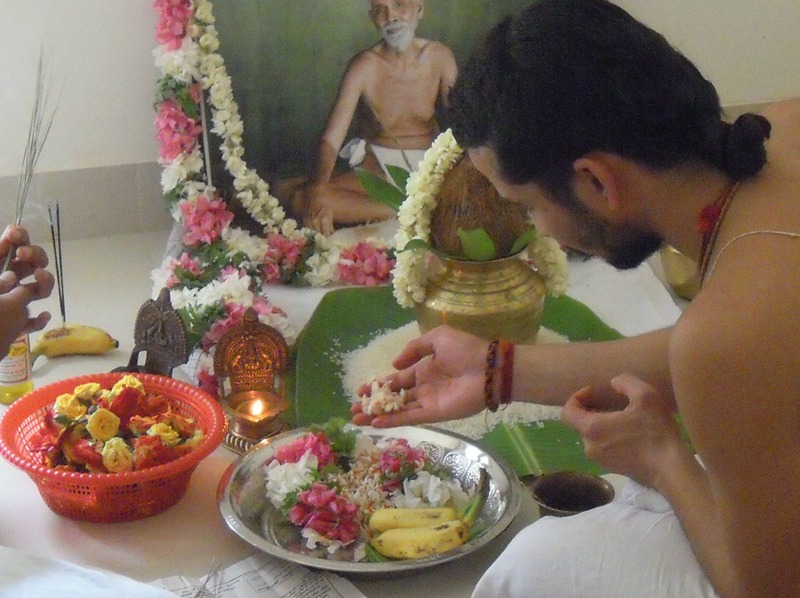 Before the priest can start the pooja, the picture of Ramana Maharshi must be graced with flowers. 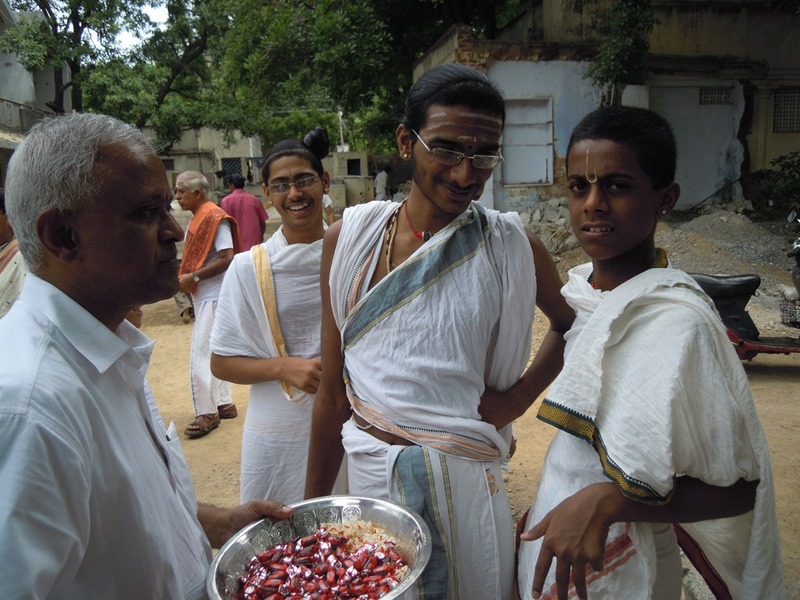 A few young men from the Vedapatasala join in. 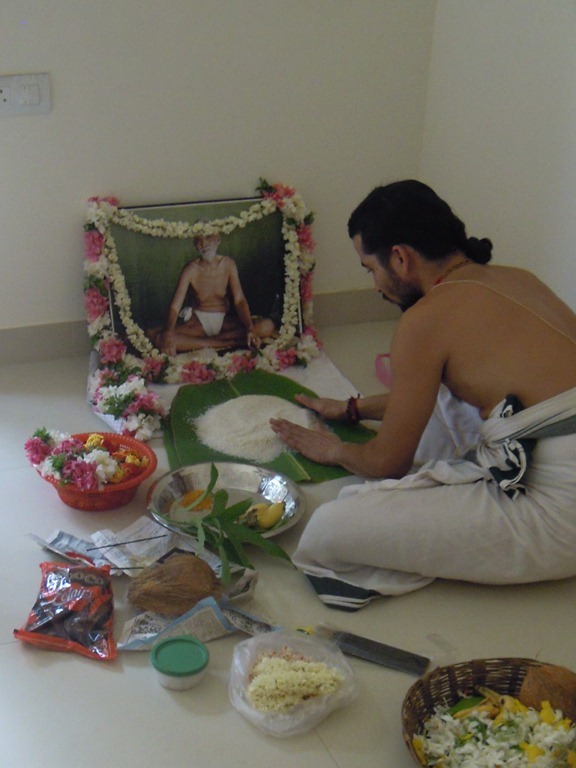 A banana leaf is set out, and a pile of rice laid out on it. This will become the base of the water pot and coconut that is soon to be added. The water pot is placed on the rice. Water fills the pot. A bed of mango leaves is added, then the coconut put into the water pot. 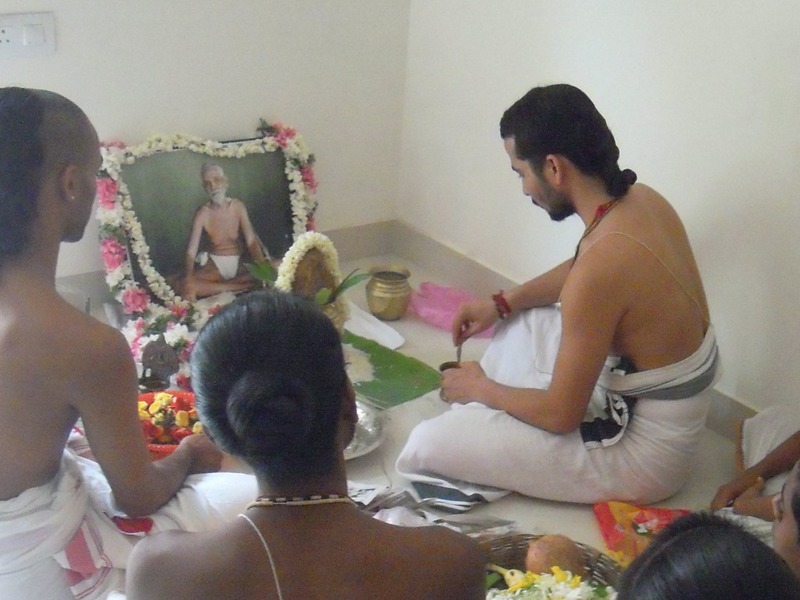 This becomes the god that is addressed in the pooja. 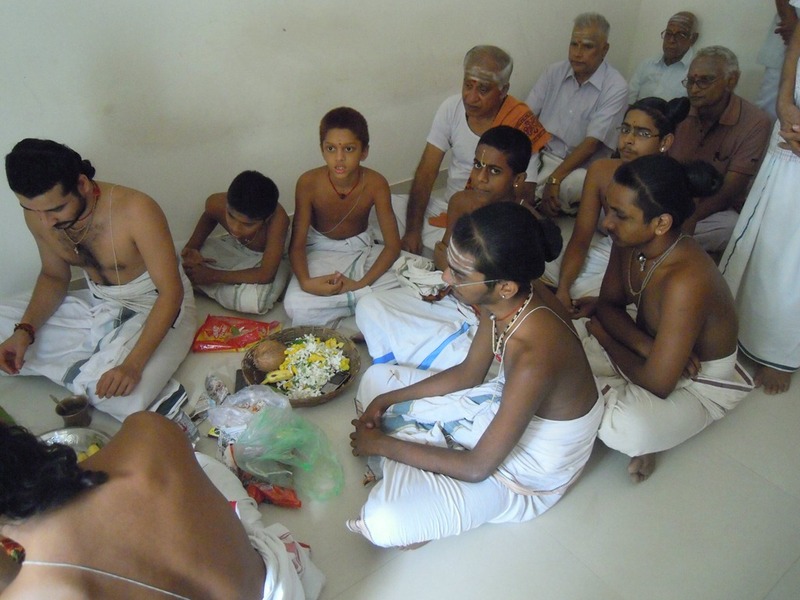 Eight young men from the the Vedapatasala sit in front of the pooja altar, along with N. S. Ramanan. 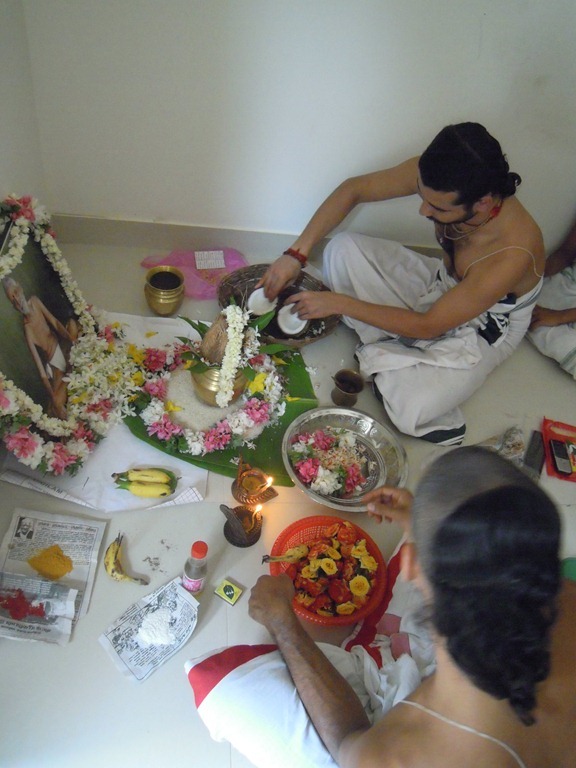 People have now come into the room for the pooja. 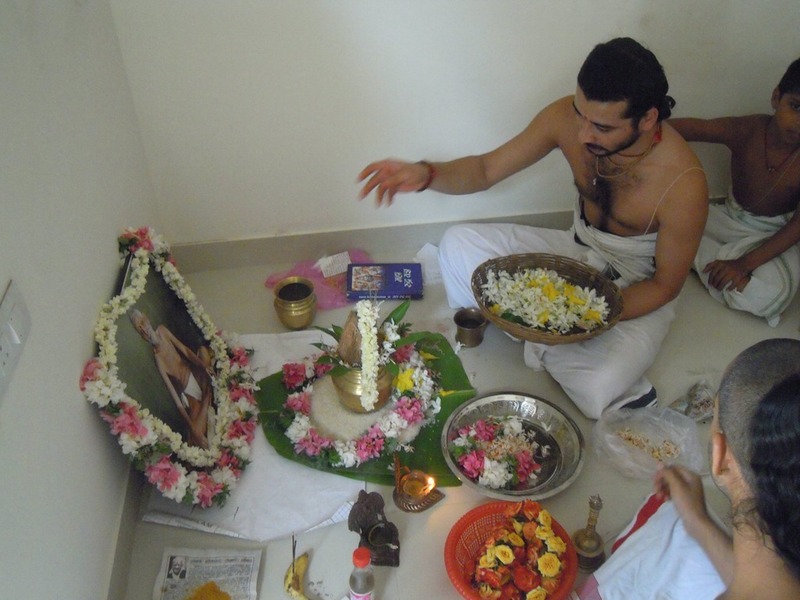 The pooja is underway. The priest is chanting and making gestures with his right hand. I have seen this before, but do not understand what this signifies. Perhaps a reader can educate me? One of the boys from the Vedapatasala looked up at me. 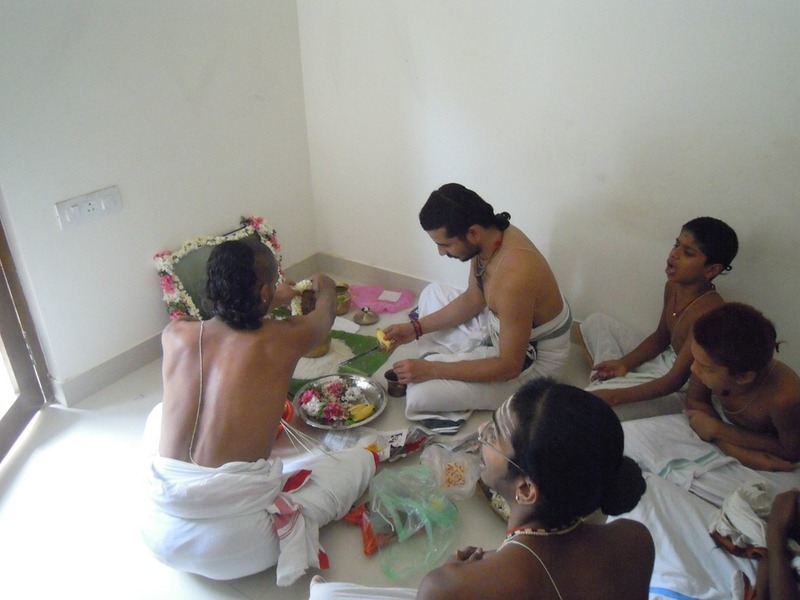 The priest is adding something to the pooja plate that is being assembled. I can’t quite make out what it is. Flowers? 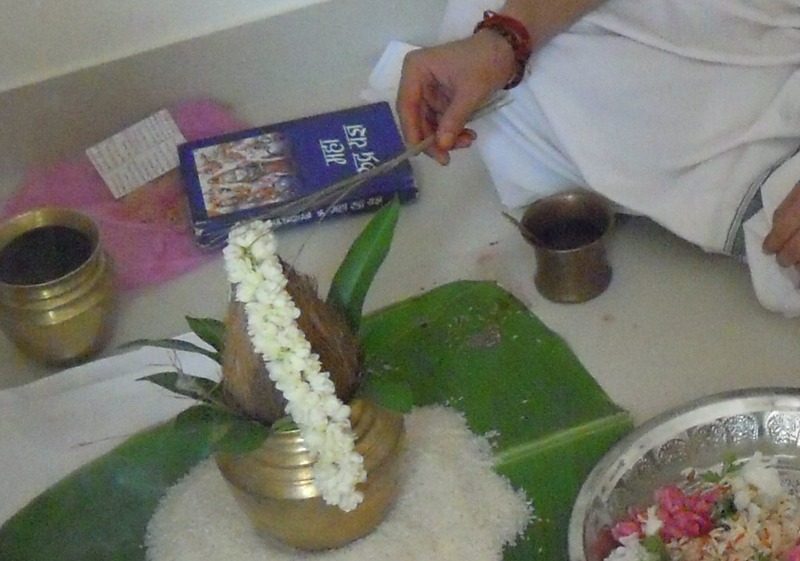 A white flower mala is placed atop the coconut. 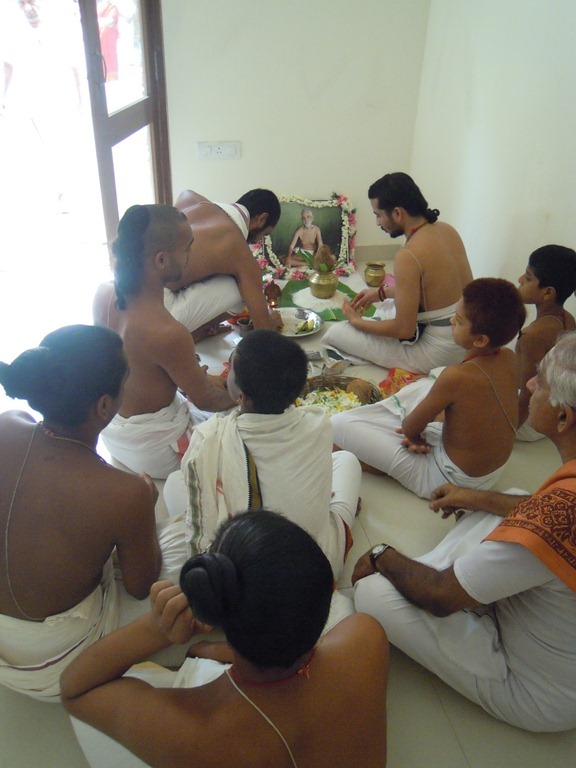 Below, young men from the Vedapatasala, along with a few men from Ramanasramam, watch the pooja intently. I think this is a special treat for the youngsters, who do not usually perform this kind of important function. 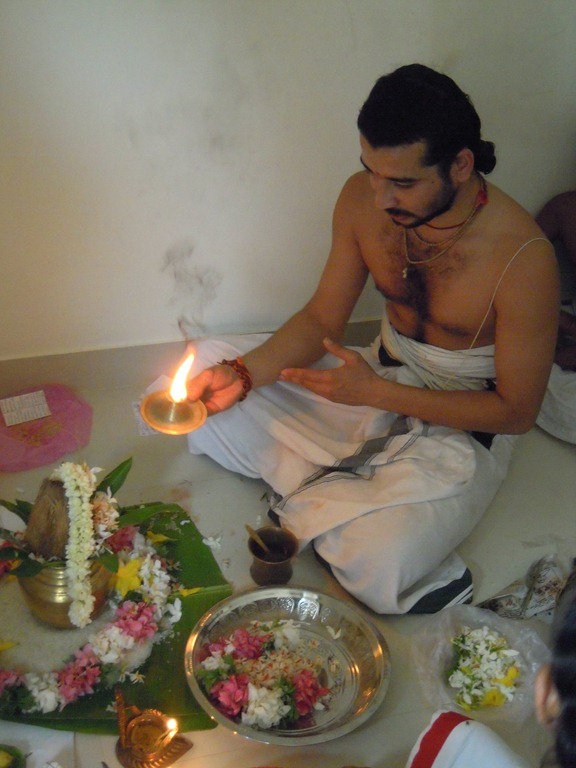 A lamp has been lit, and flowers are being added to the pooja plate. This plate will be presented to the Ashram president at the end of the pooja. 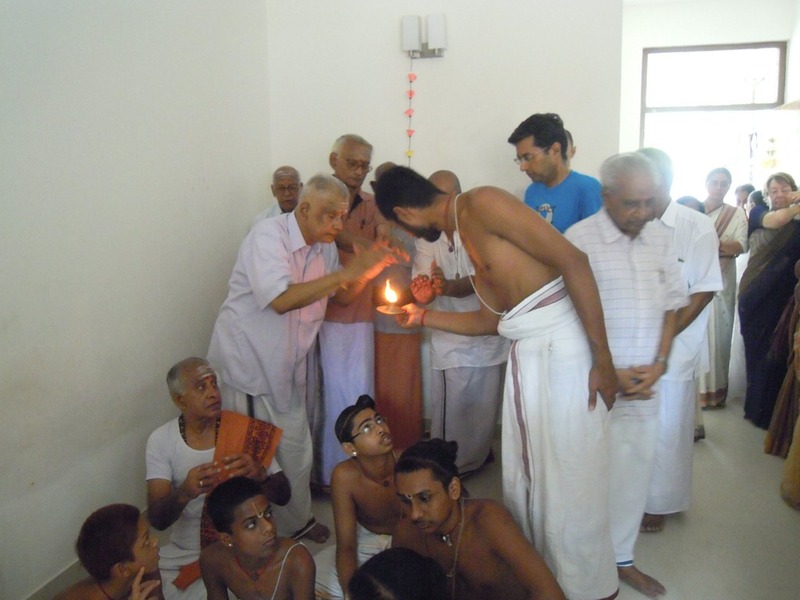 Camphor is lit and offered to the pooja god. 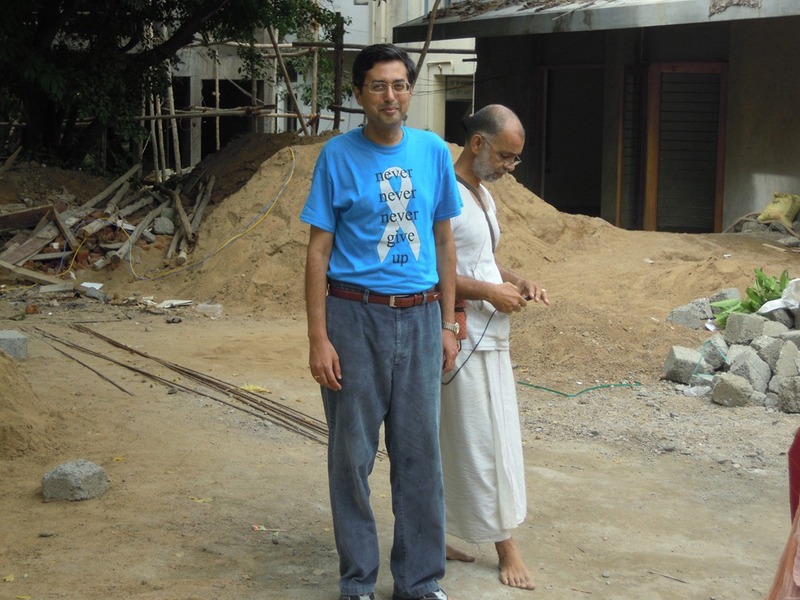 Sundaram and Dr. Anand stand and watch. 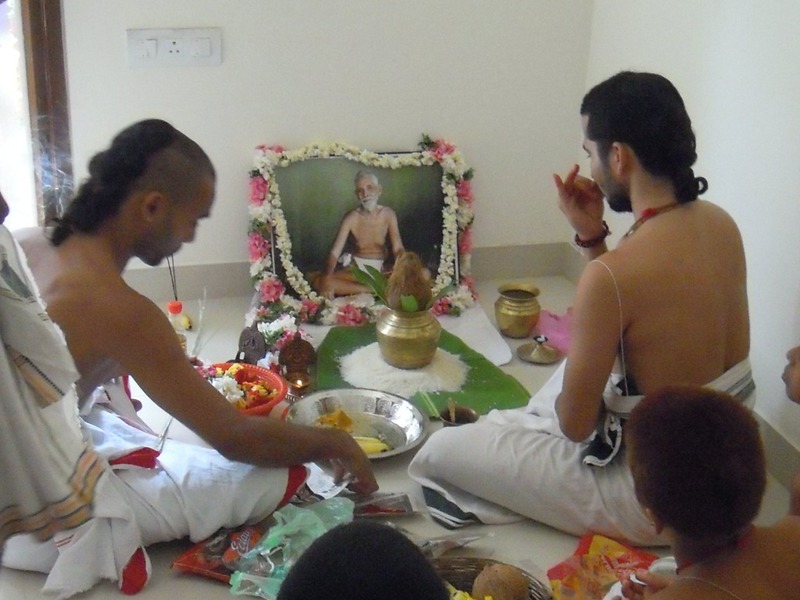 The room is filled with devotees of Sri Ramana Maharshi. 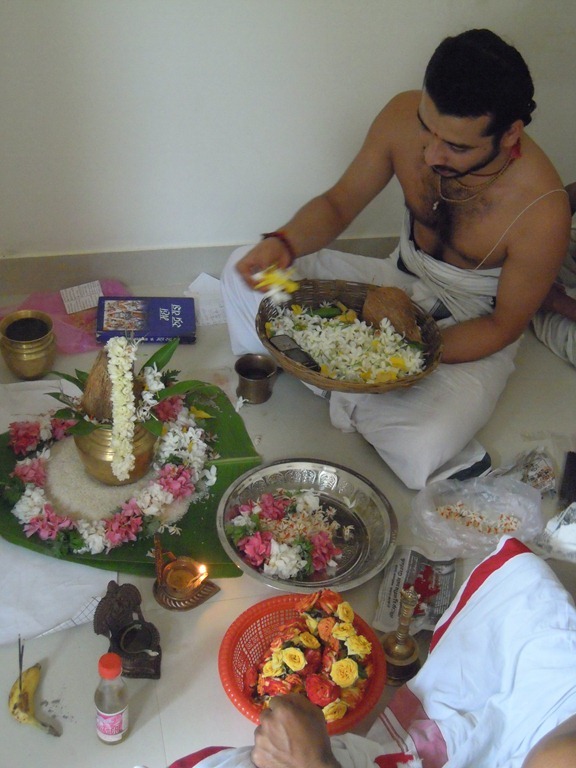 The priest chants, and as he chants, adds spoons of water to the pooja leaf. 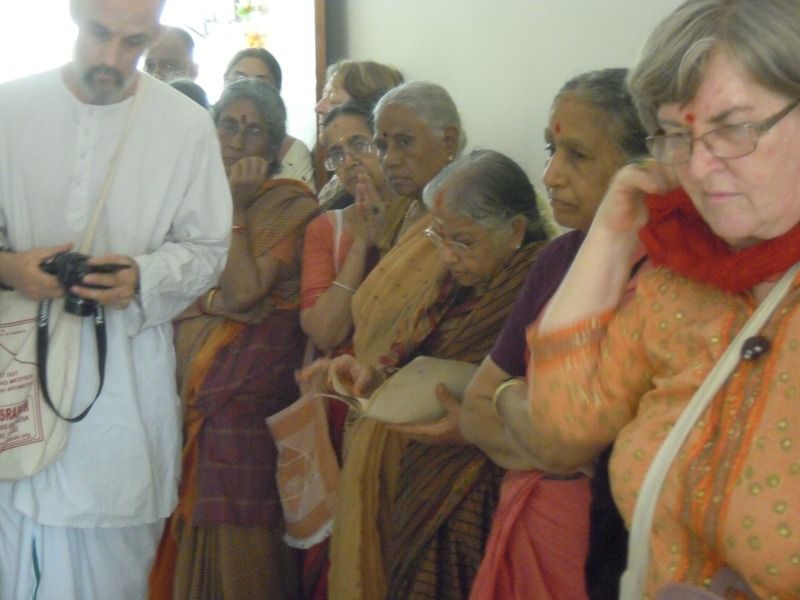 Most of the chanting is from memory. 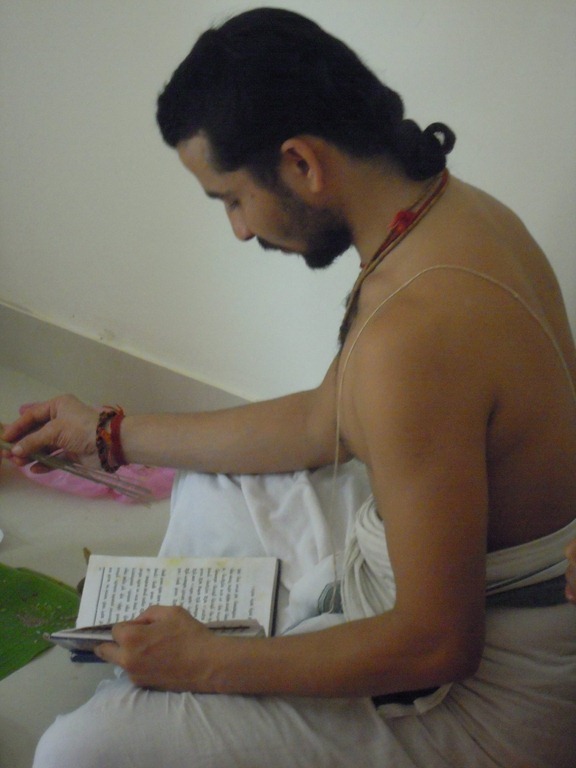 But one part must be unfamiliar, so he reads from a Sanskrit text. 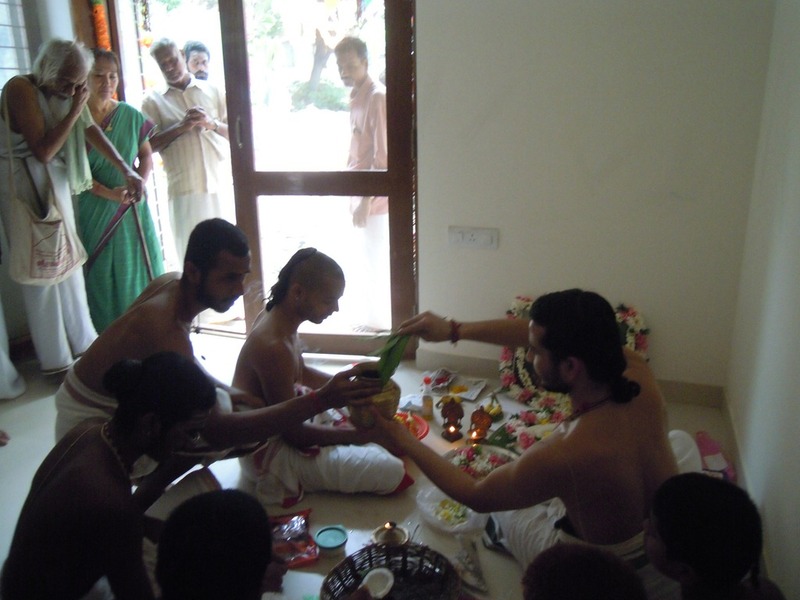 The priest holds sacred grass against the pooja god, and chants. (Durva, a specific kind of sacred grass? It is revered. Pluck a blade of grass and it sprouts back. 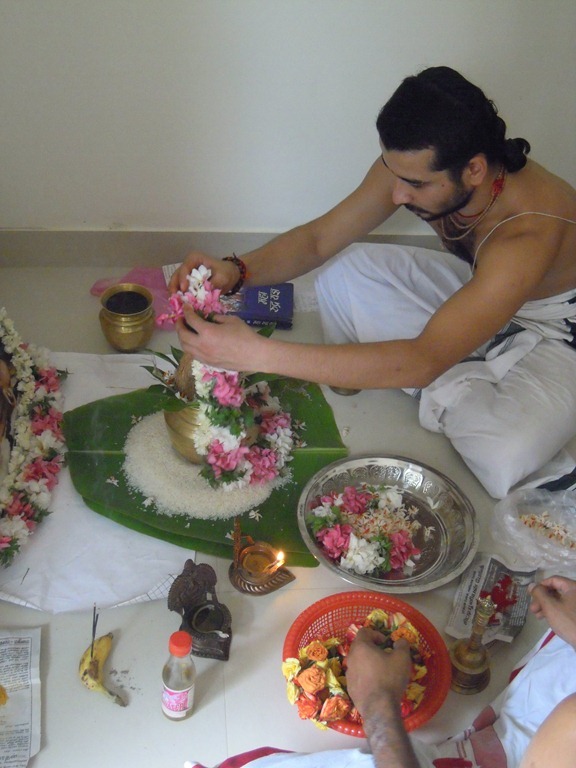 This makes it a powerful symbol of regeneration, renewal, rebirth, fertility, and hence prosperity) He holds the grass this way for a long period of the pooja. 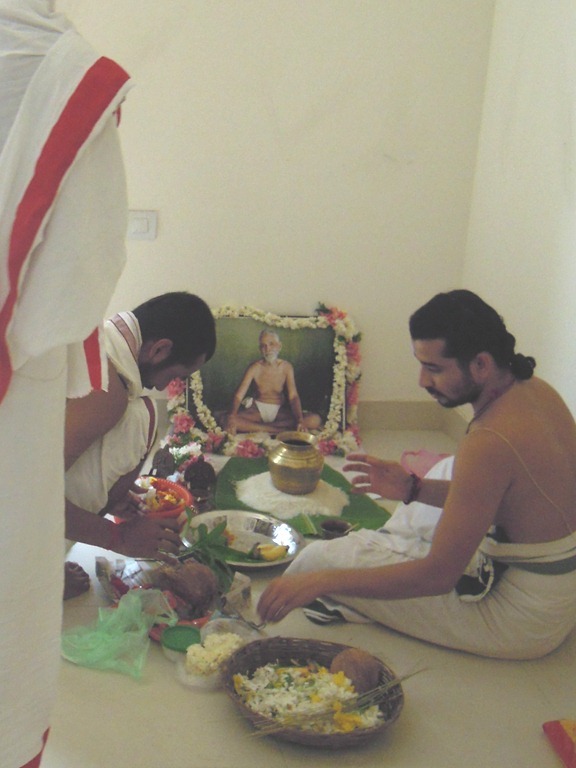 Flowers are tossed at Bhagavan’s feet, while ‘108 names’ is being chanted. Another spoon of water is added. 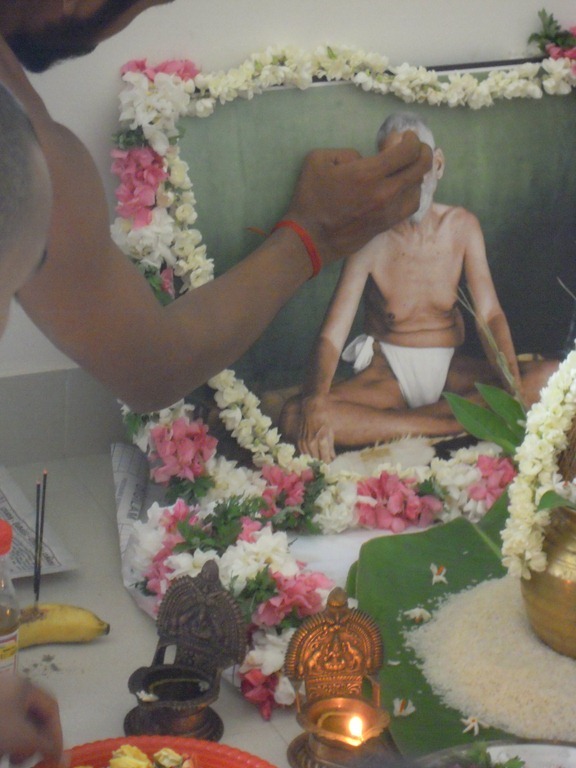 Turmeric is added to Sri Ramana’s forehead. 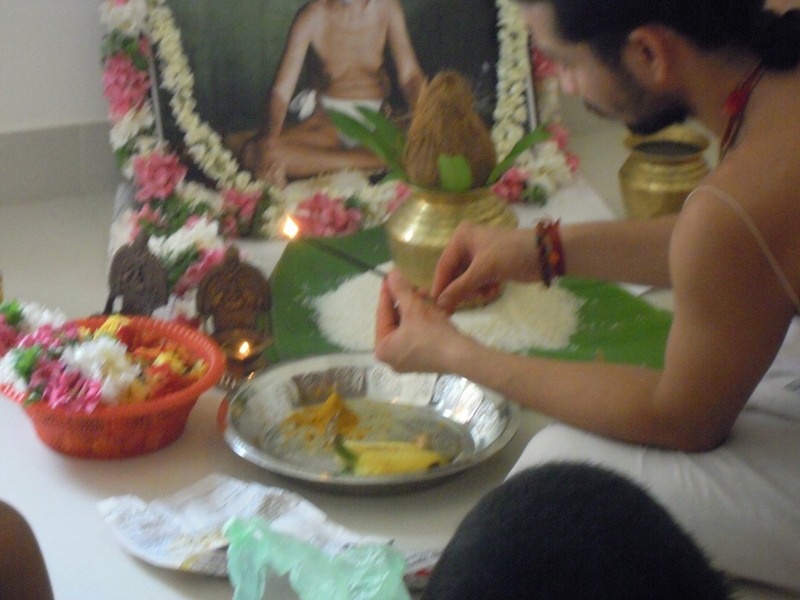 And one more flower mala is added to the coconut god. As the chanting continues, more flowers are tossed by the priest. Then incense, stuck in a banana, is offered. One youngster rings a pooja bell, a Ghanta. 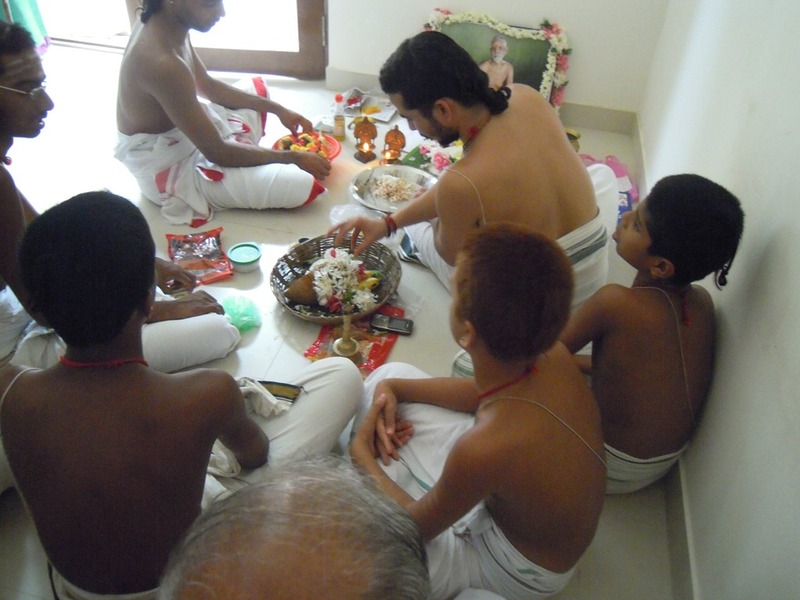 The pooja is nearing the end. 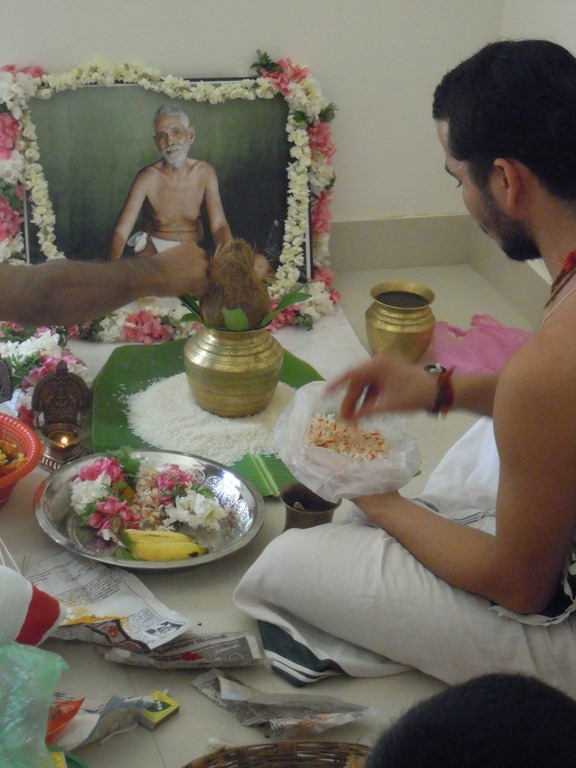 A coconut is broken and added to the pooja plate. 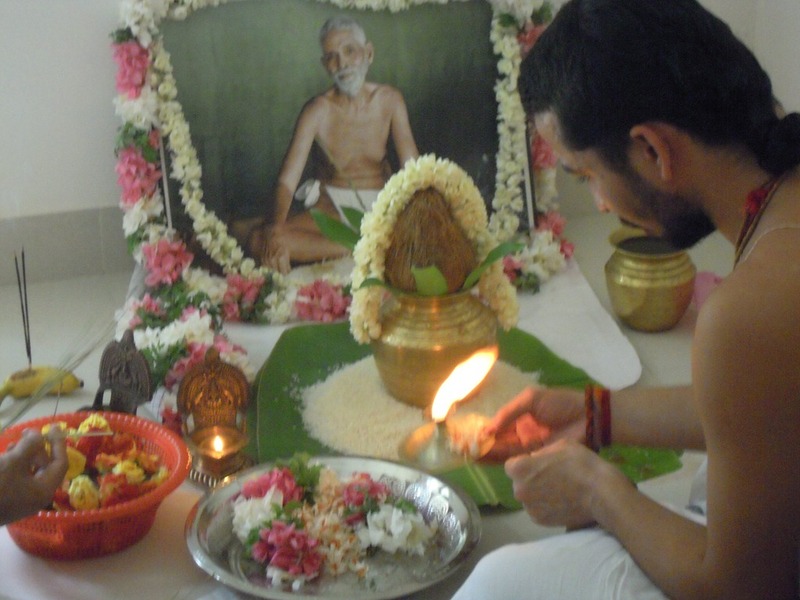 Camphor is lit and offered to Ramana and the gods. The coconut is removed from the water pot, then the mango leaves are removed. 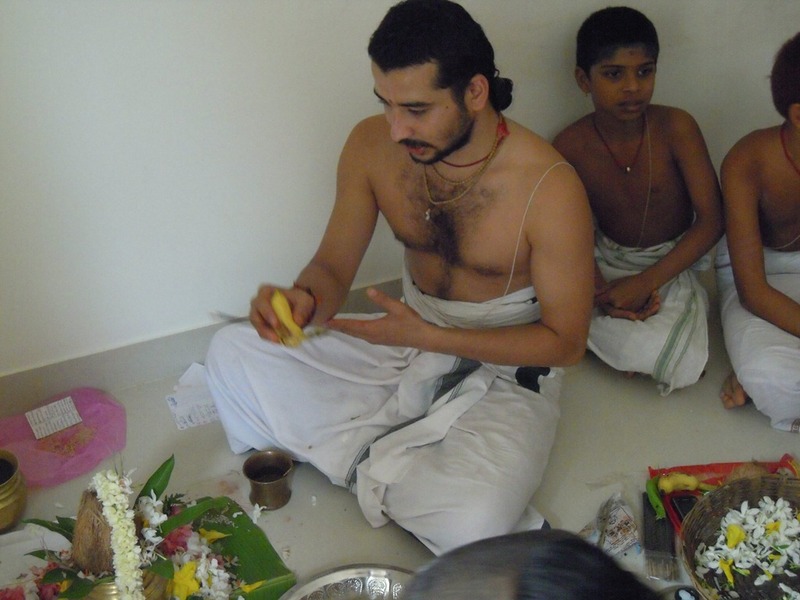 The mango leaves are used to sprinkle holy water on all present today. This water is from the pot that housed the god and is a special blessing. 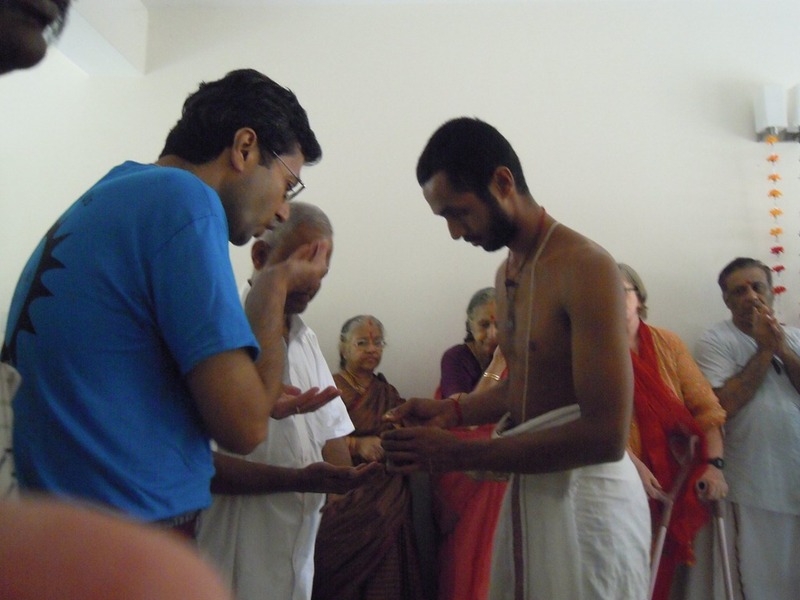 The priest takes the pooja plate. And presents it to Sundaram. Holy water is offered to each of us. Dr. Anand sips it. Hands are eagerly extended to take this water. 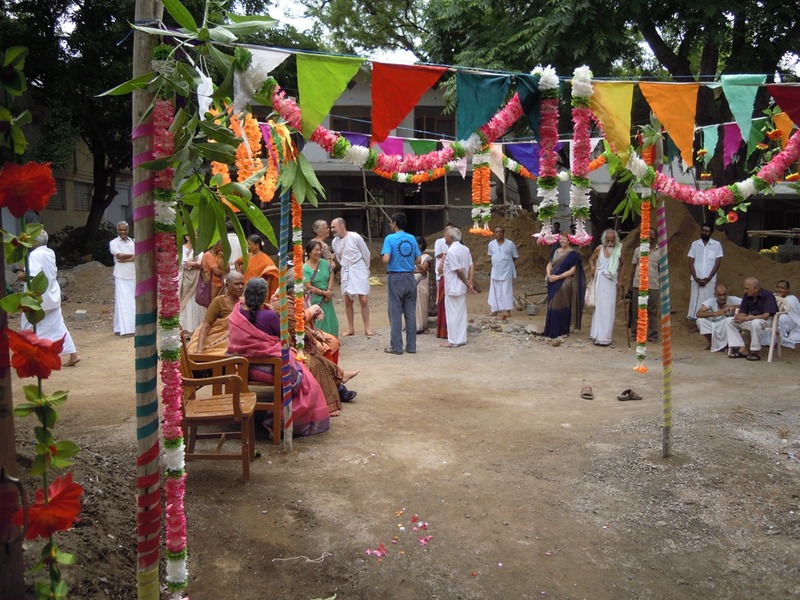 At the end of the pooja, a garland of flowers is added to the front doorway. 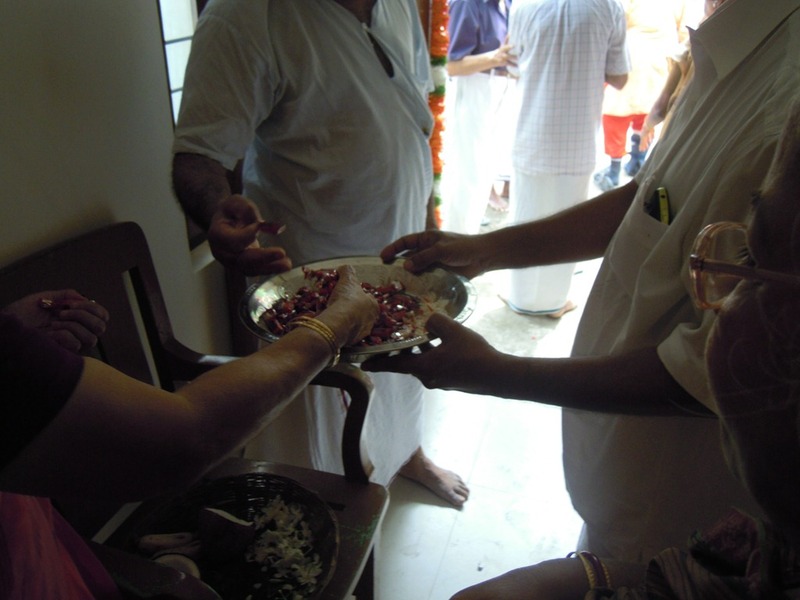 Finally a plate of caramel candies is offered, so each person might take some food from the pooja. Afterwards, the people who attended today’s event gather outside the room to enjoy the afterglow of the pooja, and to have a few words with each other before they all depart. 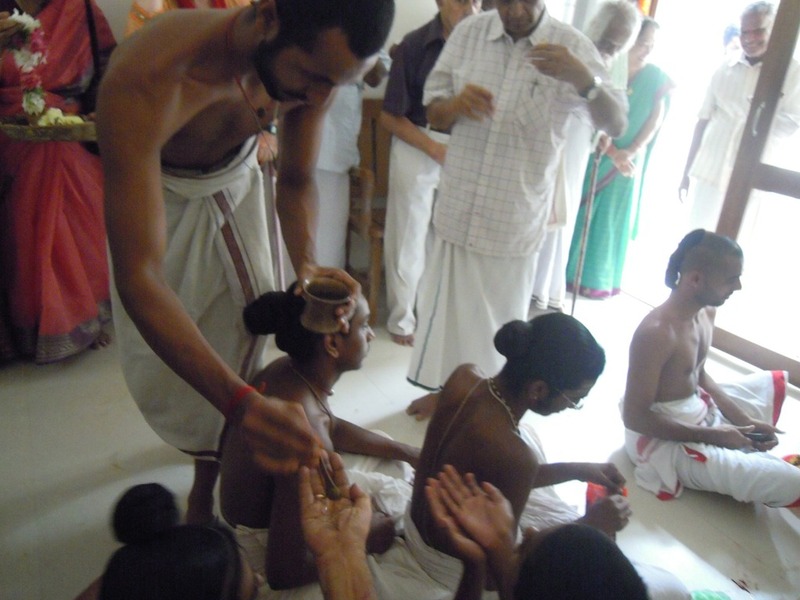 The young men from the Vedapatasala get a caramel too. The new rooms in the Morvi Guest House Compound now have an auspicious beginning, and soon will be welcoming their first guests. 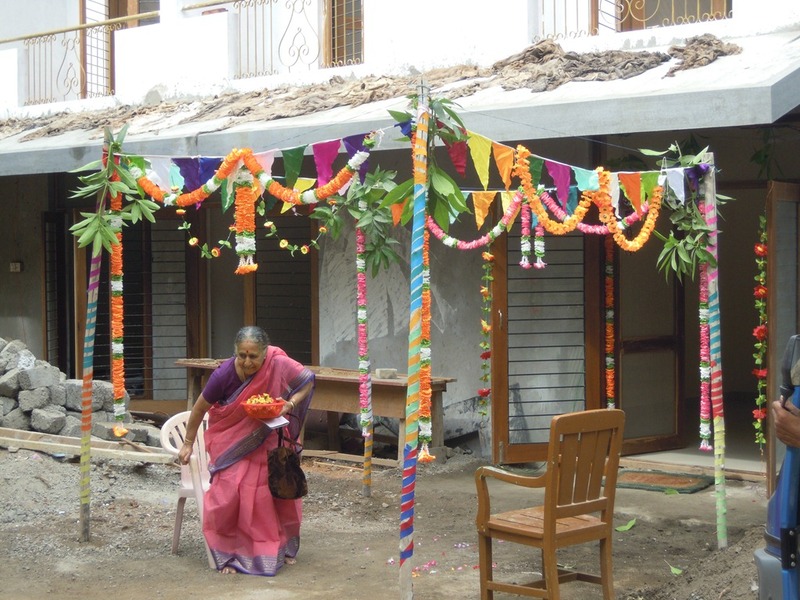 The management of Ramana Ashram is to be complimented for this project. 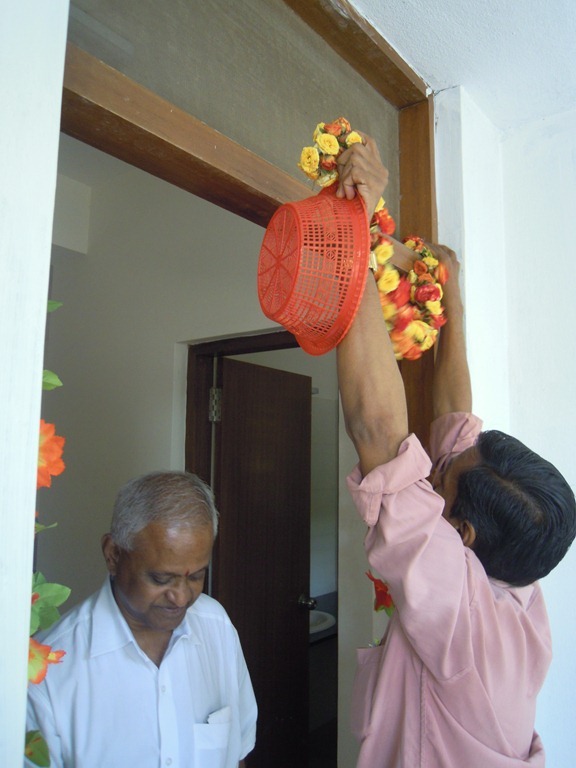 It provides more and better housing to be used by the thousands of guests who stay at Ramana Ashram each year. 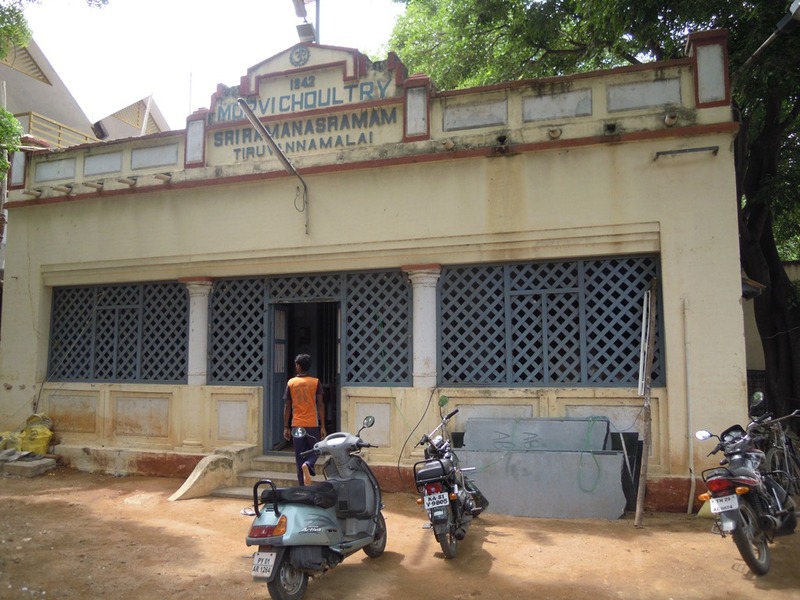 This entry was posted on September 10, 2012 at 2:54 pm and is filed under Festivals, Celebrations and Rites, Ramana Maharshi, Tiruvannamalai, Tiruvannamalai News. You can follow any responses to this entry through the RSS 2.0 feed. You can leave a response, or trackback from your own site. In the fourth photograph I originally failed to recognize Smt. Susila Ramanana when I wrote the article, and did not put here name in. This was pointed out and I corrected it. I apologize. No disrespect was meant. Thank you. I have seen this before and never knew its significance. Awesome Pictures. Can’t thank you enough Richard.